A couple of weeks ago I found a recipe for making jam without added pectin. I had just gotten some apricots and wanted to make jam with them since I love apricot jam. Since I have always wanted to try making it without added pectin, I decided, why not? It was relatively easy. The recipe was easy to follow, not a whole lot to do, just a lot of cooking. I learned about and was able to try 3 different "gel tests" to see if the jam would set. I'm glad I decided to venture out and try something new. 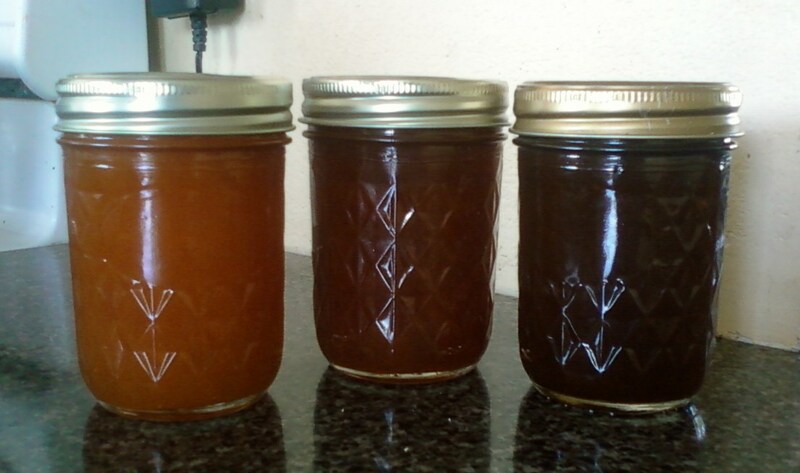 In the end I ended up with 3 batches of jam that vary in consistency and color, and a new skill. What have you learned by trying something new? I'm linking up to the Thrifty Homes Penny Pinching Party. Head on over and check it out. Want to learn more frugal-living-skills? Why not sign up to get new posts delivered to your inbox. Have you ever opened your phone bill and noticed a little flyer stuffed inside advertizing a new phone plan? It's probably cheaper than the one you're currently on too. Ever wonder why the phone company didn't tell you about this new, cheaper plan earlier? Yeah...they don't do that do they. That's why it's a good idea to check with your phone company often and see if a better, cheaper plan is available. The last time I did this I cut $20 a month off my phone bill. How do you save on your phone bill? For more great tips check out Works for Me Wednesday and The Penny Pinching Party. I realize that this might sound crazy since it's just the beginning of July, but the back to school sales are going to start soon and I wanted to give you a heads up. Start watching the weekly circulars for the best deals. Some of my past favorites have been the penny sales at Staples. I hope they continue this year. You can usually find a supply list on your school districts website if you don't have one. Before I shop I'll look around at home to see what I already have. No sense in buying colored pencils when you already have them right? When do you start getting ready for back to school? Have any great sales to share? Please do! I love all the great ideas I get over at Works for me Wednesday and The Penny Pinching Party so I'm sharing this post with them.